Modeling of small-scale bedding geometries improves recovery estimates in Norwegian oil fields, yielding added value of at least 16 million barrels. Statoil geologists could not capture the fine-scale interlayering that would later impact their reservoir property simulations and reserve predictions. 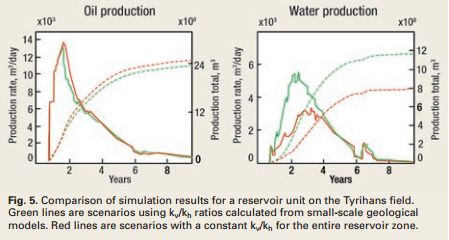 A unique multi-scale reservoir modeling tool developed by Geomodeling enabled Statoil to better understand its reservoir assets and choose the right strategies for optimized recovery. Carsten Elfenbein and Philip Ringrose, Statoil ASA; and Murray Christie, Geomodeling Technology Corp.